I wasn’t entirely sure what I would find when I started reading Dread Shadows in Paradise, the third anthology from Golden Goblin Press that I’ve reviewed now (all from review copies sent to me by editor Brian M. Sammons in return for fair and honest reviews) and the one that I was most intrigued by. Given the involvement of Mr Sammonds, I knew that this was going to be a high-quality collection full of enjoyable stories, as is the case with all of the anthologies that he edits; and that, as with the previous Golden Goblin anthologies that I’ve reviewed, it would present me with Cthulhu Mythos stories in a time period and location (the early 20th Century Caribbean) that has been significantly underrepresented in the Mythos genre as whole. This definitely perked my interest, because I know just enough about the local (non-Lovecraftian) mythology of that area of the world to understand that it could easily be abundant soil for stories involving Lovecraftian deities and all of its associated canon, not to mention how the local gods and goddesses might react to an intrusion from Elder Gods into their real. At the same time, however, I realised that as a white male living in the United Kingdom, I couldn’t possibly hope to know just how well the writers would be using Caribbean folklore and mythology in their stories: would there be little more than a superficial engagement, something that seemed like the tale could have been set anywhere, with the Caribbean crudely superimposed over the top? Or would the usage be more in-depth and knowledgeable, and actually be integrated to ensure it became fundamental to the narrative of each story in turn? It was a question that I’d never really found myself asking before, and I tried to keep it in mind as I read the anthology. Dread Shadows in Paradise is a smaller-sized anthology than many, running to a total of eight tales, but the authors involved are some of the best in the genre – we’re talking William Meikle, Glynn Owen Barrass, Tim Waggoner, Pete Rawlik, Edward M. Erdelac and others, all fantastic writers of Cthulhu Mythos fiction. For an anthology that was only created as a stretch goal for one of Golden Goblin Press’ Kickstarter campaigns, that’s an impressive lineup. 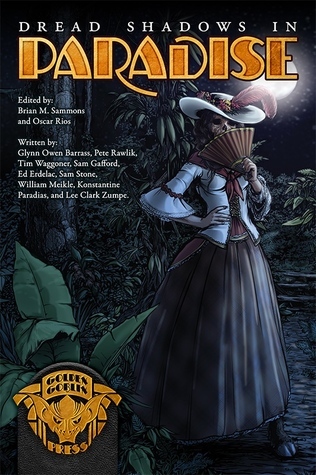 Once again I’m impressed by the cover art that Golden Goblin commissioned for the anthology, this time from artist Ian MacClean: it’s a piece that conveys the exotic, mysterious and secretive nature of the Caribbean that we’ll be seeing in the stories in the anthology; deep in the jungle, a woman in an old-fashioned dress fans herself, only for the moonlight peeking above her cockaded hat to reveal that her head is nothing more than a grinning skull. The first story in the collection is from writer and editor Glynn Owen Barrass, who starts us off with Jamal, the story of a young boy (the titular Jamal) who makes a living diving for coral and treasure in the ruins to be found in the murky waters of Kingston Harbour, by the village of Port Royal in Jamaica. There isn’t a great deal of Caribbean mythology involved in this first tale, there being no real description of the Lovecraftian deity that Jamal comes into contact with as a result of a contract to dive for a mysterious buried treasure. What Mr Barrass does do, however, is elegantly and vividly portray the environs of Port Royal and the ruins of the pirate city in the harbour; his descriptions really do bring the location to life, as well as dropping little hints that tie it into the wider Mythos theme, and I’ve re-read it several times to appreciate the prose. With the Storm, by Pete Rawlik, is a classic ‘told from diary excerpts’ tale of the kind beloved by Lovecraft and later Mythos authors, and the author uses the device very effectively to tell the tale of a French author who flees to a sleepy Cuban village to escape the US authorities, only to stumble into occult matters as a deafly storm approaches. I enjoyed the story as told by the diary entries, as we get an excellent sense of Etienne de Marigny – an arrogant, somewhat pompus and naïve author – and how he gets himself tangled up in the local affairs of the occult. There are some fantastic descriptions of the monsters that get summoned by the local cultists, and the marks that de Marigny spots on the hands of the locals lead to a genuinely unsettling and very Lovecraftian ending to the tale. The Cuban backdrop is well integrated into the tale, and Rawlik adroitly portrays the kind of careless, condescending arrogance that such white expat visitors might display to ‘quaint’ local customs that are actually anything but quaint. Crop Over, by Tim Waggoner, is an impressive piece of writing that takes an honest and often harrowing look at the poverty that many of the inhabitants of the Caribbean suffered from during the period, and the lengths that a parent would take in order to ensure that their children survived. Ustine is the mother of a very young daughter, who barely seems to be alive throughout the story; and as the plot unravels, we see just why her child is so unnaturally still, and also the Faustian bargain that she and her husband have made with a local god in order for the child to survive. I’m not sure if the ‘Mr Harding’ deity is a real one, but he is richly portrayed in Crop Over, and there are some subtle but unmistakable links to the Cthulhu Mythos and Mr Harding. Tradewinds by Sam Gafford is a nice, straight-forward action-adventure piece, as the crew of a Haitian trawler discover, to their cost, what exactly their mysterious passenger is doing taking a voyage into the middle of the ocean. Once again Edward M. Erdelac appears in a Golden Goblin Press, and once again I am hugely impressed and appreciative of the story that he provides. Gods of the Grim Nation is one of the stories that features his repeat protagonist Zora Neale Hurston, an American anthropologist who, in this story, is visiting Post-au-Prince to investigate the mysteries of Voodoo amongst the native population. It isn’t long, however, before she is thrown into the heart of a conspiracy and a desperate fight against an Elder God-worshipping cult with links to the highest level of authority. Several things struck me as I read Gods of the Grim Nation: the first was that Mr Erdelac had obviously done his research on the religions found in Port-au-Prince, and particularly Voodoo, because the entire piece is saturated with detail that is used to brilliant effect, both in terms of world-building and plot progression, as well as characterisation. I felt like I was actually becoming knowledgeable about these religions, and as a result the story also felt authentic, at least to an outsider. Secondly, I enjoyed reading a strong female protagonist, especially one who is well-informed about local religion and occultism, but who can also get into a tussle if needed. This was a hugely enjoyable story, and for me was by far the best in the collection. The Gold of Roatan from the pen of Sam Stone was an enjoyable occult romp through the island of Roatan, as a former soldier turned private investigator searches for the relatives of a legendary and long-lost pirate, only to realise the price of greed when the gods themselves are involved. And surely only William Meikle, one of my all-time favourite authors, could manage to pull off the tremendous feat of making a tax collector the engaging and even sympathetic protagonist of a Cthulhu Mythos tale; and yet that is what he manages with aplomb in Sugar Rush, the aforementioned Customs and Excise official finding that collecting taxes from an almost-abandoned sugar plantation is rather difficult when a Shoggoth is in attendance. Meikle’s greatest gift as a writer has always been his skill in effortlessly creating an atmosphere that draws in the reader, and this skill is on display here; the descriptive prose he uses to describe the plantation and the rotting, sugary molasses surrounding it and encompassing it is so effective you can almost taste the sugar. Coming to a close, Konstantine Paradias’ tale, Hearth of the Immortals, is a fascinating tale that merges together the arrogance and sins of colonialism with standard Mythos tropes, while also making use of a historical storm that almost devastated the Dominican Republic in 1916 in order to create a unique and chilling tale of occupation and vengeance. Then the final tale in the anthology, Upon An Altar In The Fields by Lee Clark Zumpe, is a slow-paced, tense and quietly horrifying tale of an American becoming entangled in a cult on the island of St. Croix and finding that there is an unusual price that can be paid to escape its clutches. With Dread Shadows in Paradise, Golden Goblin Press and editor Brian M. Sammons have created an incredible anthology that has filled yet another blind spot in the Cthulhu Mythos genre. The stories it contains are uniformly excellent, well-written and often engage with Caribbean folklore, legends and history in some surprising and subtle ways. This is now the third anthology from Golden Goblin Press that I have read and reviewed, and I think I can say with quite some confidence that they are making their own unique and much-needed contributions to the wider Mythos genre, and I can only hope that they build and expand upon this in order to continue providing much-needed variety and originality to a genre that is often in danger of going stale, repetitive and too inward-looking.